Today’s workplace is changing. As society is aging, workers’ skill sets must keep pace with employer expectations and consumer demands. The “baby boomer” generation, those individuals born between 1946 and 1964, makes up a substantial portion of the U.S. population and has a significant impact on the economy. As more of them retire and leave the workforce, serious deficits in the labor supply are occurring especially for jobs requiring specific technical and applied skill sets. Other positions involved in building infrastructures. In recent years, educators and politicians have emphasized sending high school students to a four-year college rather than a vocational school or technical college. In 1984, the Carl D. Perkins Vocational and Technical Act was first authorized (and then reauthorized in 1998) as a federal law that provides funds for career and technical education (CTE). However, the act focuses too much on post-high school occupational training and not enough on introducing skilled trades to students in their last two years of high school. In some measure, society has focused on getting all young people into four-year colleges. Jobs that do not require a four-year college degree have been undervalued; “blue collar” jobs are not where you are going to find the “big bucks.” This sends a wrong message to students: by not attending a four-year college, they will have unfulfilling careers. The reality is that many students just aren’t interested in college. They would rather work with their hands. 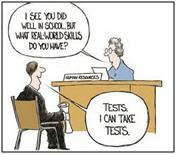 We must address these educational challenges in order to prepare for the future workforce deficit. School districts must develop effective school leaders and staff that will integrate curricula with academic and technical skills, build strong support systems in the community and implement federal and state policies that will address a new approach to school reform. This article focuses on community support through the partnerships between businesses and school districts in developing school-to-work programs for high school students. Obtaining a general understanding of the skill area needed by the company and the students that can be considered for the program. Proactively working with a company to assess its needs and resources to be able to successfully initiate and support an active apprenticeship program. What will be the duration and time of year they will host this program? Is the company able to physically handle the additional space and equipment needed to mentor these students? How many students can the company handle at a time? Employers using unpaid interns are well advised to review and update their internship programs and policies to comply with federal and state standards. To avoid liability, employers can protect themselves by clearly understanding what classifies an employee as an unpaid intern by the U.S. Department of Labor’s guidelines. Employers can get into trouble when they view unpaid internships as a way to accomplish work tasks rather than as educational programs aimed at assisting students. Promoting and getting business-wide backing for job apprenticeship programs through the support of the entire business, from the CEO to senior and line managers. There needs to be big picture buy-in or it will be a constant struggle to allocate resources and have ongoing support. Making sure that apprenticeship supervisors have the time and resources to effectively manage the students and the program itself. Interviewing and conducting background checks and contacting references of those individuals within a company that are directly involved in the apprenticeship programs. Developing an orientation process and onboarding students into the company’s apprenticeship program. High school apprenticeship programs not only prepare students for the workforce by gaining experience in an applied or technical work skill, they also provide students with employability skills such as attendance, communication, initiative, teamwork, reliability, flexibility and workplace standards. Meeting the future challenge of a growing deficit in the U.S. labor supply for technical and applied skill sets will require the collaborative support and effort of legislation, educators, businesses and the community. See link to New York Time article on the Newport News, VA Shipbuilding Apprentice School for an outstanding example of how an apprenticeship program should be operated. My grandfather graduated from this program in the 1930’s and had a successful 42 year career at Newport News Shipbuilding. Public schools need to work with private sector and government employers on providing a solid base of educational skills to students who want to enter this type of training. Real apprenticeships, like those at Newport News Shipbuilding, require that students be well trained high school graduates before entering these types of programs which provide 4 to 5 years of training and work experience. In my opinion, many of the training programs that are now being called “apprenticeships” are nothing more than limited on the job training courses and do notmeet the requiements of a true apprenticeship program.